In one of today’s two Gospel readings, Christ comes upon several men, Sts. Peter, James, and John who, the Gospel says, had been fishing all through the night and had caught nothing. After spending some time teaching His message, Christ turned his attention to the fishermen. At the Lord’s bidding, they returned to their boats and, putting their faith in Christ’s words, once again let down their nets. And they caught an abundance of fish, enough to break the net, enough indeed to fill two boats and to cause both nearly to sink. Peter seeing this miraculous catch of fish, confesses to the Lord that he, Peter, is a sinful man. Christ responds that while they now catch fish, soon they shall be catching people. We note first that after Christ had commanded them to let down their nets once again, Peter, who was certainly an expert in fishing, disputed the possibility that any fish would be caught. They had fished all night, he insisted, and caught nothing. His mastery of his occupation told him that to lower the nets again would be a waste of time. Nevertheless, Christ commanded that he do it, and he did. Christ was teaching his followers that they must put their trust in Him, even when it seemed a waste of time, even when it seemed foolish, even if they thought they knew better. The obedience of these men to Christ command was rewarded by a huge catch of fish. Christ commands us, equally strongly, to put our trust in Him and to obey His commands. Sometimes that seems illogical to us, and yet that we must do. When, for example, illness overtakes us and puts us through pain and suffering and doubt about our future, we must still look to Him, place our trust unconditionally in Him, and believe that in our obedience, we shall eventually find our reward. The second message is that though we try in our lives to accomplish certain things, and fail, we must never cease trying, we must never give up. Peter, after working all night, was ready to give up, to surrender to failure. But he did not, thanks to Christ’s insistence. Those disposed to give up, especially in their spiritual endeavors, are truly lost should they give in to their impulses. For those who struggle on, despite all, can only triumph at the end. The Evil One never stops trying to tempt us by discouragement. But we must not listen. Next note that Peter confesses his sinfulness, but Christ, at that moment, seems rather unconcerned, telling him to “fear not.” Christ sees into Peter’s heart and He knows each and every sin dwelling there. But Christ also knows, by Peter’s own humble confession, that he has already repented and has already resolved to follow a different path. St. Bede, a great seventh-century Saint of the West said that, “The Lord soothes the fears of the unspiritual man so that no man need be fearful in his conscience because of his own past guilt; or, confounded at the sight of the innocence of others, be discouraged in setting out himself on the road to sanctity.” Christ loves us all and regardless of our past sins and offenses, wants us all to turn humbly to Him. About sins confessed and repented of, Christ is unconcerned. We are taught also by this Gospel passage the power of God. God possesses absolute dominion over all of His creation, and can and does work miracles. The Old and New Testaments are filled with stories of the miracles of God. The lives of the Saints are likewise filled. The history of the Christian peoples also records many miracles. Lives thought lost are saved. Suffering and distress are transformed into peace and abundance. Nations threatened by certain catastrophe are saved by God’s intervention. Generally, such miracles are a reward for prayer and faith, but a reward that must correspond to God’s plan for mankind as a whole, and for each of us as individual souls. We are not promised rewards, necessarily, in this life but must sometimes wait until the next. Nonetheless, the rewards are given. 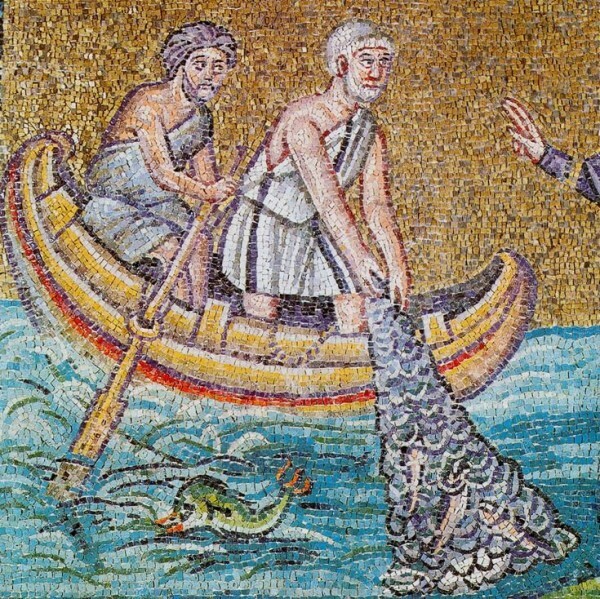 In today’s Gospel, Christ rewards the faith of the fishermen with an abundant catch. He also rewards them by making them His Apostles, which brings us to the next lesson in this passage from St. Luke. “From Henceforth thou shall catch men,” Christ says. Peter, James, and John become Apostles and spend the remainder of their lives winning multitudes to the Church. From an earthly standpoint, this is a questionable blessing. These men are wrenched from a way of life they have known, and with which they are reasonably comfortable, and charged with the task of bringing whole nations to Christ’s banner. These are simple men, unrefined men, ignorant of worldly knowledge. Yet, Christ makes them leaders of His Church. Today’s Gospel says that, “having brought their ships to land, leaving all things, they followed Him,” they followed Christ. None received material rewards in this life for their trouble. Hardship, toil, hatred, violence, and finally death by martyrdom was the worldly price paid by these men for obedience to Christ. Yet, they obeyed, and they were rewarded with eternal life, adorned with martyr’s crowns in the Kingdom of Heaven, and venerated by all the Faithful of the Church as Saints—until the end of time, Christian men and women remember their names, and honor them for, and seek to imitate them in, their absolute fidelity to Christ. We too, as simple Orthodox Christians, are called to catch men for Christ. Consider, for a moment, the state of the world around us. Consider this city we are in, and the cities and towns nearby. Consider the frightful nature of the world, of the overflowing cup of evil all around us. Consider the huge numbers of confused and frightened people, darting this way and that, like frightened fishes in a great dark sea. Some, though perhaps not all, would doubtless find peace and joy if they could but find Christ, in the fullness in which we find Him in Orthodox Christianity. We need only lower our nets, as Christ bids us, and we can catch them for Him. How do we do this? We can do it by witnessing for Christ through the lives that we lead. If we are kind, patient, and generous towards our neighbors, that in itself is the beginning of our witness. If we are models of Christian piety in our lives, praying, keeping the fasts, attending Liturgy, and remaining close to the Church, that too is a witness and will attract a larger catch. Finally, we must not be ashamed of Christ’s Church by hiding it from those around us. 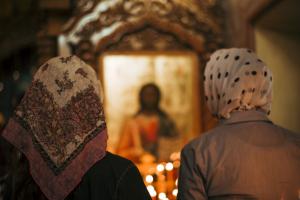 If neighbors or friends or acquaintances have no religious life, or if they are dissatisfied in their current religion, we can invite them to attend Liturgy and introduce them to Orthodox Christianity. Some people believe that Orthodoxy is only for Greeks, Russians, Romanians, and so forth. Nothing could be farther from the truth. 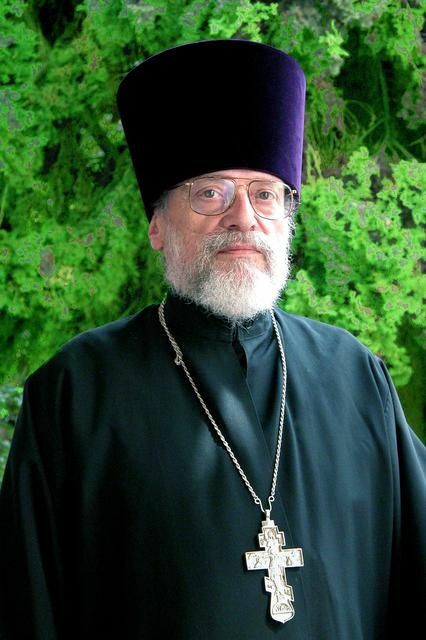 Orthodox Christianity is not a collection of tribal Churches, it is the universal Church, the Church of all mankind. So, let us not be apprehensive in sharing the beauty of Orthodoxy with others. Let each of us strive to follow in the footsteps of Sts. Peter, James, and John, by becoming catchers of souls for Christ. Let each of us also put aside all those things that distract us from our real purpose in this life, let us leave those things, as the Gospel says, and, like the Apostles, follow Christ. Fr James Thornton, Protection of the Holy Virgin Mary Russian Orthodox Church, Los Angeles California, September 20/October 3, 1999.